Movies are expensive to go see in the theatres and they only seem to get more so every year. It’s discouraging and disappointing that something so many of us love to do is slowly becoming an expense we can no longer justify. The snack bar alone could make your mortgage cry. In every city I’ve lived in, these usually fall on a Tuesday and they usually mean up to half off of your regular movie ticket price. Check with your local theatres and find out which day of the week they offer cheap ticket prices and go then. There used to be a theatre near me, one of those old ones with the marquis out front. Their ticket prices were $3 & $4 when the major theatres were selling their seats for over $10. The best part, you could bring your own popcorn bowl and have it filled for $2 with free refills all night! While mine closed eventually, there are still many independent theatres across Canada that rely on people like you to stay open. Not only are you saving on your movie-going experience, but you’re also speaking up with your dollars, giving your support to the small, independent Canadian theatres instead of the massive, multi-billion dollar American chains. Landmark theatres, which are across most of Canada, offer a free popcorn to those who sign up for their newsletter, which is full of more money saving promotions. Cineplex offers Scene-it rewards which earn you free movies and popcorn and the usual movie-going fare. Instead, bring your own. It’s cheap to pop your own corn (and if you use coconut oil and a little cayenne pepper, it tastes better!) and to bring your own refillable bottle of water. Even if you don’t want the healthier choice, buying those Milk Duds at Superstore beforehand is going to be a lot cheaper than the ones at the theatre. 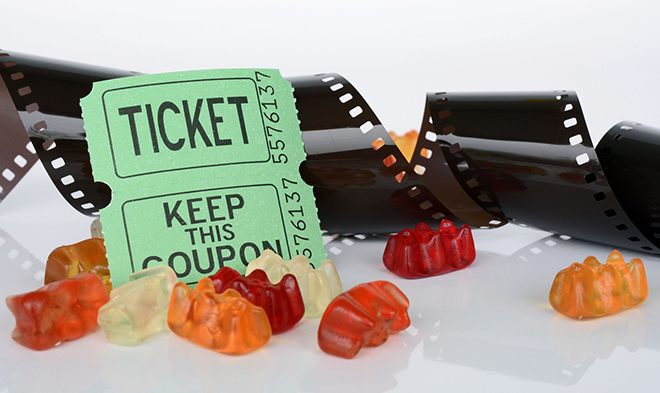 For some reason, many of us don’t think about the movies when we think about coupons, but the major chains and independent theatres alike both offer coupons often. You can check your favourite coupon listing sites, like Smartcanucks.ca to find coupons for the movies. Of course, there’s always the option to wait for that movie to come to Netflix, pop your own corn, and snuggle under a blanket on the comfort of your own couch, instead. There is no reason to turn your nose up at a cozy movie night in your jammies! What are some of the ways you save money at the theatre? Let us know in the comments!